One of The « Bordeaux, Famous, Picturesque Wine Villages» Collection. By Gordon Frickers, measuring 34 x 46 cm (13½” x 18″) sold. Looking for the very best in wine art? You have found it here: Timeless paintings, the test of true classics. 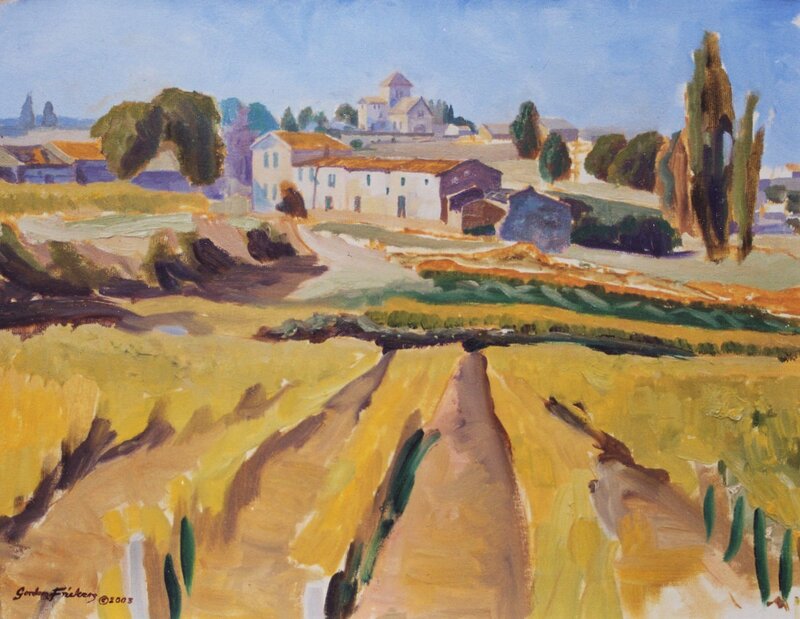 A painting that finished itself, made as a ‘plien aire’ study at this charming village in the Commune of Saint Emilion. Time conspired, it did not allow Gordon Frickers to return. Nevertheless, a charming spontaneous #artwork , an original, loose interpretation that invites us to fill in the details with our imagination. Montagne de Saint Emilion, a few kilometers North of Saint Emilion, produces Saint Emilion wines with a touch less tannin so fruitier.